There are two schools of thought about grilling and smoking. One belief is that it is an art form as old as humanity itself. 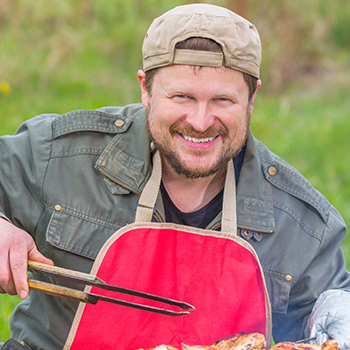 Throughout recorded history, grill masters have been admired with near god-like reverence. Their ability to command the basic elements of fire and smoke into a swirling dance of flavor that transforms the “catch of the day” into a feast suitable for kings is legendary. The other camp is convinced that the scientific application of heat and smoke to a designated protein creates a series of chemical and physical reactions, thereby transforming it into a pleasantly palatable substance suitable for human consumption. Alex Coleman’s family has been farming in the Piedmont region of North Carolina longer than anybody remembers. The area is famous for “Lexington Style” barbeque, which focuses on pork shoulder barbeque served up with a variety of sauces based on ketchup, vinegar, and peppers. But Alex’s daddy taught him so much more than that about grilling and smoking. As a young boy he helped build smokers large enough to place entire hogs on a rotating spit inside. Then his daddy taught him how to put up to 5 turkeys on that same spit, wrapping them in chicken wire to hold them together as they would slowly smoke for many hours to reach perfection. Alex found his life’s calling in the whirling spires of smoke that drifted lazily from the vents in those old home-made smokers. He won his first barbeque competition as a teenager and has never stopped. Throughout the summer months, Alex travels far and wide to share nibbles of his knowledge with hungry participants at barbeque festivals throughout the South. He combines the smokes from different woods – Apple, Cherry, Maple, Hickory, and more – the same way a painter uses a variety of colors to create a masterpiece. The result is delicious barbeque cuisine that is truly a work of art. Dan Morrison grew up with a game controller in his hands. As a young boy in Austin, he excelled in classes like computers, math, and science. He was fascinated by the notion that all of life can be broken down to basic numbers and calculations. It wasn’t the swirls of smoke that interested him at first. He was spellbound by how the application of a certain temperature would, over a specified amount of time, cause the protein molecules in a piece of meat to “unwind” and turn that raw meat into a delicious meal. Dan’s barbeque tastes are formed around the Central Texas styles that focus on the quality and preparation style of the meat being served and less on the sauces that go with it. The style also expands well beyond traditional pork offerings to beef, goat, and other meats. His job has given Dan the opportunity to travel to many different parts of The United States, and his appreciation for different styles of grilling and smoking have expanded well beyond what he knew as a boy. But every time he tastes a knew variation, he reverts to his scientific roots to examine exactly what it is that makes one style different from another.